well, i did go out and do what i wanted to do but unfortunately the rain had started before i had a chance to video anything, so i will have to make the video in a week or so when the rains stop... the wheat is off so i was able to drive right back to the bush and pull that camera out of there, the crew should be in there soon to start harvesting trees... i did see a big mature doe on the way back on the edge of the corn field.. i checked the cameras in our bush we have our 2 mineral sites at and watched a little buck and another big mature doe browsing on beans in the field.. i had a few video's ( cameras are set to video for now) of a couple nice doe's and i had a pic of what looks like Crazy Eight again... i brought the trail camera i pulled from our main bush and took it to the new area we just got... based on my use of topographic maps and my Huntstand App, i was able to pinpoint one main area I wanted to focus on.. it's the far end of the new property and i chose this area because the bush really opens up.. when i was in there, i found a trail about 40 yards in the bush off the cut wheat field and man, it looks like a great spot.. even with the foilage on the trees, i can see quite a way in the bush .. this spot is fairly open, right on a heavily used four wheeler trail and it has some dense areas around it so this will be a good area.. i set my deer poppers out and my deer 'caine then mounted the camera, now we wait.. i apologize, really wanted to get a video but i will make a video when i go in to check the spot in about a week... will keep you all posted... here is the most recent pic of Crazy Eight.. looks like him, not the best angle but I am sure this is him.. Right on. I have yet to see my target buck on my sites since January. But deer are definitely active on them. I use the dicalcium phosphate, trace mineral, stock feed salt mix which makes 252lbs for a little under $70 from my local feed store. Right on. Great pics guys. 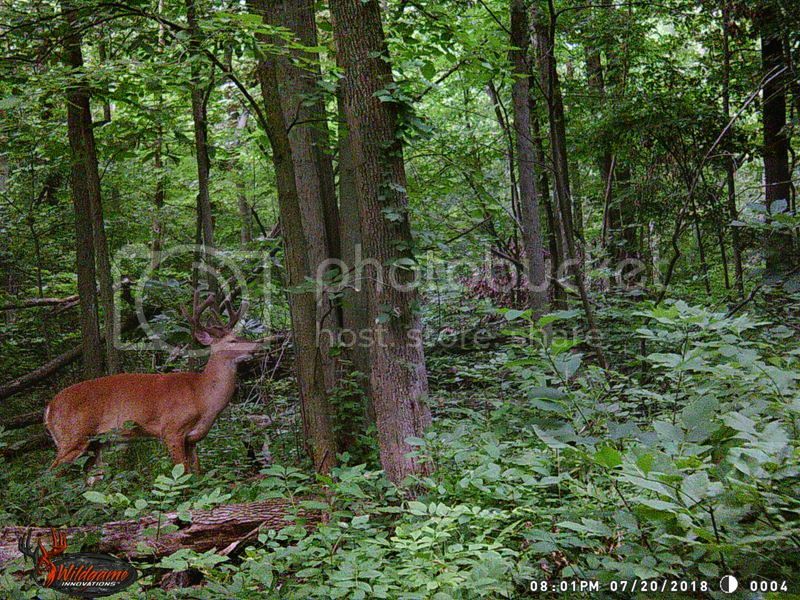 I have to wait labor long weekend before I check my cameras again. I live too far from my Deer property. Can’t wait to go back. I try to make it out to replenish them every couple months during or just before a rainfall. I premix the stuff in buckets (i happen to use old kitty litter buckets that have a lid and have a stack of them ready to go). I pour about half a bucket at each spot. I'd say 6-8 liters. I don't know if that's too much or not enough, but I will say, one site that I've stopped adding mineral to since last fall still has deer coming by to check it out. I only know this from tracks, since my camera there was stolen. awesome, i will start to look for the supplies and try to make some.. love the deerlix and deer 'caine but it's pricey and then you have to worry about inventory / stock issues when stores run out... i had a site that i didn't replenish and deer were still hitting it almost 2 years later.. it was crazy... stuff works for sure... i will try my TSC store to see if they have anything..